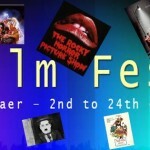 We are excited to hear that a Film Festival is to be held for three weeks in October starting on the 2nd. The Stranraer Film Festival “StranFilmFest 2015” will be based at The Grainstore in Bridge Street, Stranraer. The films will be screened in a marquee inside the Grainstore which will provide a unique atmosphere in which to enjoy the many films which are listed below.